*Straps not for use in automobiles. Very pleased with my travel pillow. Liked it so much that I purchased one for my husband. I was suprised that such a soft pillow could be so supportive. I’ve never been able to sleep on an airplane before but with this pillow I can. I highly recommend giving it a try. Thanks Cabeau! I am 70 yrs of age and have been traveling by air for 49 years. I am both a Qantas Platinum and a Cathay Pacific Diamond One World frequent flyer, i.e. I fly a lot. I have had a number of neck pillows through the years, but I just used their Evolution® S3 Travel Pillow for the first time on my 16 hour flight from Dulles Intl. in Washington D.C. to Hong Kong. By far, the most comfortable travel pillow I have ever used! The flat surface and flat bottom put my neck and head in the perfect position to sleep, without any aches or pains when I woke up 7 hours later. You won’t regret purchasing this specific pillow, as you can also attach it to your headrest on the seat, so it keeps you positioned upright. In addition, the pillow rolls up and you can fit it inside a small bag that comes with the pillow which is only about 30% of the pillows size, taking up much less room in your carry on bag when you travel to and from the airport. Google Cabeau travel pillow discounts and you won’t have to look hard to find a $10 off voucher, so you’ll get this $39 pillow for only $29. I am obsessed with this pillow! 15 hours flights in economy class and I’m sleeping through them like an angel without a sore neck! Highly recommend if you travel a lot. I’m shocked that more companies aren’t making pillows that hold your head up like this! There is definitely a quality issue when it comes to the zippers on both the cover and the bag. When I got the pillow the cover zipper was broken- they sent me a new one without hesitation but then the carrying case zipper broke on that one! (Hence 4 stars instead of 5) I have not yet contacted customer service but despite these zipper issues I would STILL recommend this pillow to anyone. They have great customer service if you have any trouble. Love the travel pillow, use it always for plane travel. Great service – the carrycase was too small & began to deteriorate & they replaced it without any hassles & very promptly. Most impressive. This pillow is very comfortable however the zipper needs improvement. I took it off to wash it and and it takes two people to get it zipped up again as it gets twisted when you remove the cover . The zipper is already coming loose from the material. I’m giving it openly three stars for the fact that the cover is already falling apart. I have encountered this traveling pillow few years ago when i was in the plane. I was so sick having a severe headache and the guy next to me was very nice to lend me his pillow. It helped ease my pain during the entire flight. I asked him what was that kind of pillow and he gave me the name. Once i got home I told my girlfriend about it and she ordered 2 for my son and i as my birthday gift. I loved it a lot, my son loved it a lot too. After a few years the lock broke and i can no longer use it. We recently ordered a bundle of Evolution S3 pillows and blankets. It is the best traveling pillow there is. Although the case zipper broke the first time i tried to use it, i contacted the customer service and Allen responded right away and replaced the broken cases. Superb product and superb customer service. I highly recommend this pillow, don’t even bother to buy other product. This is it! 5 star for me. GET THIS!! I purchased the S3 in the airport on my way to a 4.5 hour flight. I can never sleep sitting on a plane up but I SLEPT on the plane for TWO HOURS with this pillow! With other pillows my head would bob down and I could never really sleep. I did not use the straps to connect to the seat but I like the option of having them. The zipper on the case broke while trying to put the pillow in – but when I came home the shop I bought it from gave me a whole new pillow/case set! I’m very happy with my pillow. I travel for work a lot, and these are the best pillows out there (my neck thanks you). The zipper broke on my case, but the customer service was amazing and I got a new case within days. 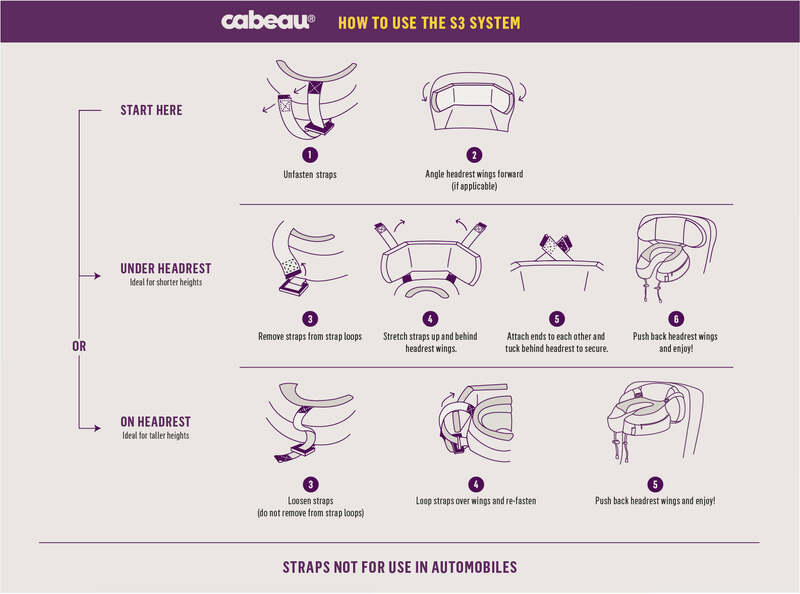 I wish more companies took care of their customers the way Cabeau does.